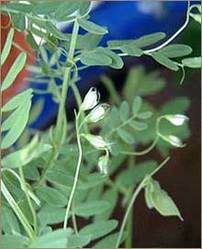 Habitat : Wild in kashmir, punjab and upper gangetic plains and also cultivated in other parts of india as a pot-herb. Uses : Fenugreek seed has been used for stomach upset, swelling (inflammation) of the upper air passages or throat, appetite, for lowering blood sugar and for softening the stool. It also has been used as a gargle to relieve sore throat and as an external dressing for swelling (local inflammation). The Seeds are very nourishing and are given to convalescents and to encourage weight gain, especially in anorexia nervosa. Research has shown that the Seeds can inhibit cancer of the liver, lower blood cholesterol levels and also have an antidiabetic effect. The Seeds and leaves are anticholesterolemic, anti-inflammatory, antitumor, carminative, demulcent, deobstruent, emollient, expectorant, febrifuge, galactogogue, hypoglycaemic, laxative, parasiticide, restorative and uterine tonic. The Seeds can be ground into a powder and used as a poultice for abscesses, boils, ulcers, burns etc. or they can be used as a douche for excessive vaginal discharge. One of its constituent alkaloids used in cancer therapy. An essential oil is obtained from the seed - used as food flavoring and medicinally. The dried plant has a strong aroma of hay. The leaves are refrigerant and aperient and are given for vitiated conditions of pitta. A poultice of the leaves is applied for swellings.